The company is made up of Elena Hall and Hmad Ourdaras with the help of his brothers in Merzouga. Elena, an American, has spent 10 years off and on in the village of Merzouga in the Sahara Desert of Morocco where she and Hmad, a local Berber from Merzouga, set up a Desert Hotel - HAVEN LA CHANCE DESERT HOTEL - with restaurant / camping / bivouac / camel excursions / 4x4 drives amidst the sand dunes and palm trees. Merzouga is a poor village with little outside help. Tourism is the only income besides families having a son who is in the military who helps out the family. There are no pensions for the older ones - just help from sons. Travelers spend a few days or longer and take camel excursions from 2 hours to 6 days into the Sand Dunes. Travelers slow down their schedules and mingle with the family, play with the children, watch the women make bread and cous-cous. They offer advice to the Berber men on agriculture, construction, well-digging. They are in a completely different world here in southern Morocco. Elena and Hmad travel back and forth from Malaga, Spain and some of his brothers manage the business when they are not in the Moroccan desert .Other brothers travel around Morocco on expanded tours which include the IMPERIAL CITIES of Fez, Marrakech, Rabat, Meknes and Casablanca, and other fortified towns along the coast. Of course, the travel includes the desert treks, small mountain villages, and the KASHAH routes. Elena has been accepted by all the local people who were nomads but have settled down in small villages. Other nomads live in the desert with their camels or goats and are seen on Camel excursions. Hmad is a Berber who speaks several languages-like most people who have contact with tourists who travel to Morocco. mily and friends invite you into their homes to share meals and mint tea. Guests are also welcome at special feasts and weddings and can watch the rituals, and enjoy the meals like part of the family. Elena has a great respect for these desert people- poor as they are. She and Hmad try to help them out by bringing tourists to the area. And also to acquaint guests with these special Berber people, their humble food, and generosity. This ECOTOURISM experience is a unique bonus in addition to the spacious desert. 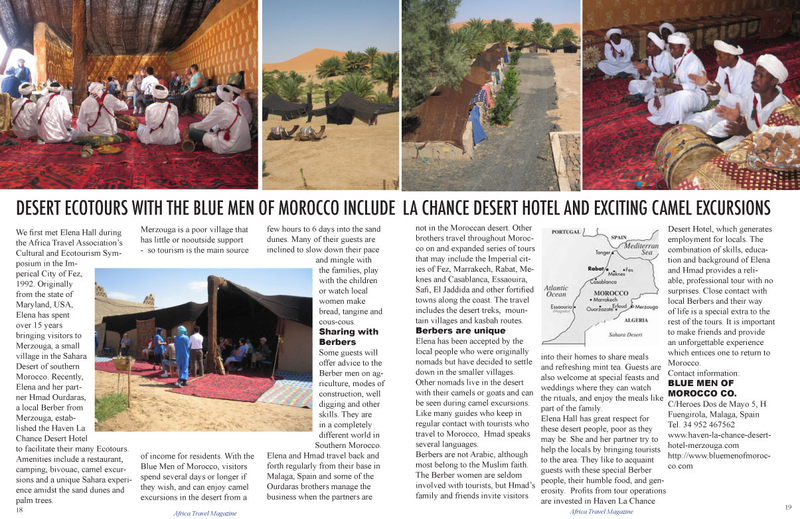 ECOTOURISM because any profits from Blue Men of Morocco Co. return back into Haven La Chance Desert Hotel where many improvements are still needed to allow work for the family members and their families. S ee photos of our new location on this site.